The name "Kingdom of Naples" was not used officially. Officially, under the Angevins it was still the Kingdom of Sicily (regnum Siciliae). The Peace of Caltabellotta (1302) that ended the War of the Vespers provided that the name of the island kingdom would be Trinacria (regnum Trinacriae). This usage did not become established. 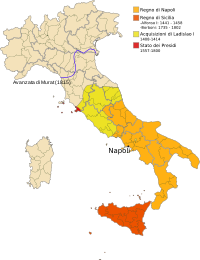 In the late Middle Ages, it was common to distinguish the two kingdoms named Sicily as being on this or that side of the Punta del Faro, i.e., the Strait of Messina. Naples was citra Farum or al di qua del Faro (on this side of Faro) and Sicily was ultra Farum or di la del Faro (on the other side). When both kingdoms came under the rule of Alfonso the Magnanimous in 1442, this usage became official, although Ferdinand I (1458–94) preferred the simple title King of Sicily (rex Sicilie). In regular speech and in unofficial documents, especially narrative histories, the Kingdom of Sicily citra Farum was commonly called the Kingdom of Naples (regnum Neapolitanum or regno di Napoli) by the late Middle Ages. It was sometimes even called the regno di Puglia, kingdom of Apulia. In the 18th century, the Neapolitan intellectual Giuseppe Maria Galanti argued that the latter was the true "national" name of the kingdom. By the time of Alfonso the Magnanimous, the two kingdoms were sufficiently distinct that they were no longer seen as divisions of a single kingdom. They remained administratively separate, despite being repeatedly in personal union, until 1816. Following the rebellion in 1282, King Charles I of Sicily (Charles of Anjou) was forced to leave the island of Sicily by Peter III of Aragon's troops. Charles, however, maintained his possessions on the mainland, customarily known as the "Kingdom of Naples", after its capital city. Charles and his Angevin successors maintained a claim to Sicily, warring against the Aragonese until 1373, when Queen Joan I of Naples formally renounced the claim by the Treaty of Villeneuve. Joan's reign was contested by Louis the Great, the Angevin King of Hungary, who captured the kingdom several times (1348–1352). Queen Joan I also played a part in the ultimate demise of the first Kingdom of Naples. As she was childless, she adopted Louis I, Duke of Anjou, as her heir, in spite of the claims of her cousin, the Prince of Durazzo, effectively setting up a junior Angevin line in competition with the senior line. This led to Joan I's murder at the hands of the Prince of Durazzo in 1382, and his seizing the throne as Charles III of Naples. The two competing Angevin lines contested each other for the possession of the Kingdom of Naples over the following decades. Charles III's daughter Joan II (r. 1414–1435) adopted Alfonso V of Aragon (whom she later repudiated) and Louis III of Anjou as heirs alternately, finally settling succession on Louis' brother René of Anjou of the junior Angevin line, and he succeeded her in 1435. René of Anjou temporarily united the claims of junior and senior Angevin lines. In 1442, however, Alfonso V conquered the Kingdom of Naples and unified Sicily and Naples once again as dependencies of Aragon. At his death in 1458, the kingdom was again separated and Naples was inherited by Ferrante, Alfonso's illegitimate son. When Ferrante died in 1494, Charles VIII of France invaded Italy, using as a pretext the Angevin claim to the throne of Naples, which his father had inherited on the death of King René's nephew in 1481. This began the Italian Wars. Charles VIII expelled Alfonso II of Naples from Naples in 1495, but was soon forced to withdraw due to the support of Ferdinand II of Aragon for his cousin, Alfonso II's son Ferrantino. Ferrantino was restored to the throne, but died in 1496, and was succeeded by his uncle, Frederick IV. Charles VIII's successor, Louis XII reiterated the French claim. In 1501, he occupied Naples and partitioned the kingdom with Ferdinand of Aragon, who abandoned his cousin King Frederick. The deal soon fell through, however, and Aragon and France resumed their war over the kingdom, ultimately resulting in an Aragonese victory leaving Ferdinand in control of the kingdom by 1504. The Spanish troops occupying Calabria and Apulia, led by Gonzalo Fernandez de Cordova did not respect the new agreement, and expelled all Frenchmen from the area. The peace treaties that continued were never definitive, but they established at least that the title of King of Naples was reserved for Ferdinand's grandson, the future Charles V, Holy Roman Emperor. Ferdinand nevertheless continued in possession of the kingdom, being considered as the legitimate heir of his uncle Alfonso I of Naples and also to the former Kingdom of Sicily (Regnum Utriusque Siciliae). The French finally abandoned their claims to Naples by the Treaty of Cateau-Cambrésis in 1559. 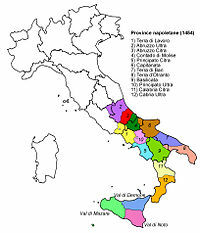 In the Treaty of London (1557), five cities on coast of Tuscany were designated the Stato dei Presidi (State of the Presidi), and part of the Kingdom of Naples. After the War of the Spanish Succession in the early 18th century, possession of the kingdom again changed hands. Under the terms of the Treaty of Rastatt in 1714, Naples was given to Charles VI, the Holy Roman Emperor. He also gained control of Sicily in 1720, but Austrian rule did not last long. Both Naples and Sicily were conquered by a Spanish army during the War of the Polish Succession in 1734, and Charles, Duke of Parma, a younger son of King Philip V of Spain was installed as King of Naples and Sicily from 1735. When Charles inherited the Spanish throne from his older half-brother in 1759, he left Naples and Sicily to his younger son, Ferdinand IV. Despite the two Kingdoms being in a personal union under the Habsburg and Bourbon dynasties, they remained constitutionally separate. Being a member of the House of Bourbon, Ferdinand IV was a natural opponent of the French Revolution and Napoleon. On 29 November 1798, he effectively started the War of the Second Coalition by briefly occupying Rome, but was expelled from it by French Revolutionary forces within the year and safely returned home. Soon afterwards, on 23 December 1798, Ferdinand fled Naples to Palermo, Sicily as a French army closed in. In January 1799 the French armies installed a Parthenopaean Republic, but this proved short-lived, and a peasant counter-revolution inspired by the clergy allowed Ferdinand to return to his capital. 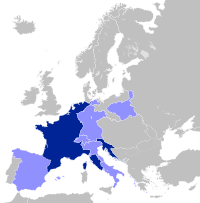 However, in 1801 Ferdinand was compelled to make important concessions to the French by the Treaty of Florence, which reinforced France's position as the dominant power in mainland Italy. Ferdinand's decision to ally with the Third Coalition against Napoleon in 1805 proved more damaging. In 1806, following decisive victories over the allied armies at Austerlitz and over the Neapolitans at Campo Tenese, Napoleon installed his brother, Joseph as King of Naples, he conferred the title "Prince of Naples" to be hereditary on his children and grandchildren. When Joseph was sent off to Spain two years later, he was replaced by Napoleon's sister Caroline and his brother-in-law Marshal Joachim Murat, as King of the Two Sicilies. After Napoleon's defeat in 1814, Murat reached an agreement with Austria and was allowed to retain the throne of Naples, despite the lobbying efforts of Ferdinand and his supporters. However, with most of the other powers, particularly Britain, hostile towards him and dependent on the uncertain support of Austria, Murat's position became less and less secure. Therefore, when Napoleon returned to France for the Hundred Days in 1815, Murat once again sided with him. Realising the Austrians would soon attempt to remove him, Murat gave the Rimini Proclamation in a hope to save his kingdom by allying himself with Italian nationalists. The ensuing Neapolitan War between Murat and the Austrians was short, ending with a decisive victory for the Austrian forces at the Battle of Tolentino. Murat was forced to flee, and Ferdinand IV of Sicily was restored to the throne of Naples. Murat would attempt to regain his throne but was quickly captured and executed by firing squad in Pizzo, Calabria. The next year, 1816, finally saw the formal union of the Kingdom of Naples with the Kingdom of Sicily into the new Kingdom of the Two Sicilies. Flag changed after Alfonso I of the House of Trastámara became King. The kingdom adopted the flag of the Spanish Empire when the Habsburg Charles V became King of Naples in 1516. Flag changed after Charles VI became King. Flag changed after Charles VII became King of Naples. Flag was reinstated as the flag of Naples after the Napoleonic Wars. Flag of Naples changed after Joachim Murat became king. Musto, Ronald G. (2013). Medieval Naples: A Documentary History 400–1400. New York: Italica Press. ISBN 9781599102474. OCLC 810773043. Porter, Jeanne Chenault (2000). Baroque Naples: A Documentary History 1600–1800. New York: Italica Press. ISBN 9780934977524. OCLC 43167960. Santore, John (2001). Modern Naples: A Documentary History 1799–1999. New York: Italica Press. pp. 1–186. ISBN 9780934977531. OCLC 45087196.